TI Connect software can be used to transfer files between a computer and your TI-84 Plus calculator. The directions for sending files from or to a calculator are a bit different. 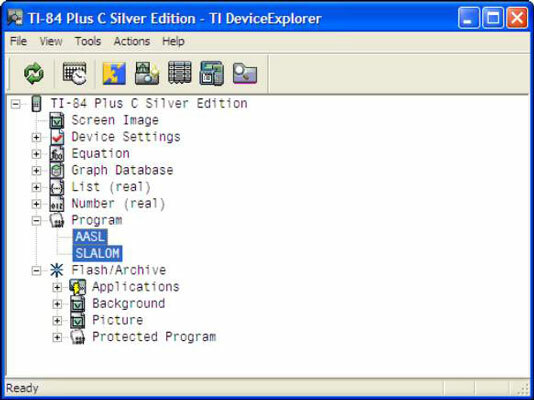 After you’ve connected the calculator to your computer, the TI Device Explorer program housed in TI Connect can transfer files between the two devices. To transfer files between your calculator and PC, start the TI Connect software and click the TI Device Explorer program. A directory appears, listing the files on your calculator. Expanding this directory works the same on your calculator as on your computer. When transferring files, you’re usually interested in transferring the files housed in the following directories: Graph Database, List, Matrix, Background (Picture and Image), and Program. If any of these directories don’t appear on-screen, that means no files are housed in that directory. Highlight the files you want to transfer. Hold the shift key on your computer to highlight consecutive files, and hold the control key on your computer to highlight multiple files not listed consecutively. Click File and select either Copy to PC or Move to PC. Copy to PC will place a copy of the file on the computer. Move to PC will delete the file from your calculator and move the file to the computer. Select the location for your files in the Choose Folder window and click OK. The Device Explorer window can be used to drag and drop files from your computer to your calculator, or vice versa. Just open a computer documents folder and a Device Explorer window at the same time and let the dragging and dropping fun begin! To copy files to the calculator from a PC running Windows, you don’t need to be in the TI Device Explorer window. Just open Windows Explorer, highlight the files you want to copy, right-click the highlighted files, and select Send To TI Device. 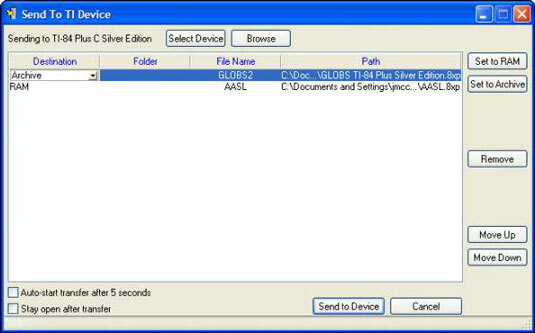 Your files are populated in the Send To TI Device window. You have all kinds of options, including setting the file to RAM or Archive. When you are ready to send, click Send to Device. Directions for transferring files from a Macintosh to the calculator can be found in the TI Device Explorer Help menu.